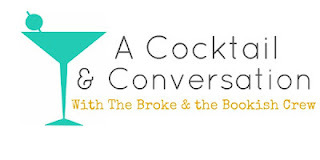 The Broke and the Bookish : A Cocktail & Conversation Time With TB&TB -- GIMME NEW BOOKS PLEASE AND THANK YOU! I definitely agree with George RR Martin! It has been far too long! Agree with Gillian Flynn, Gone Girl was THE most diabolical plot I have ever read! Also with Deborah Harkness, enjoyed the All Souls Trilogy a lot. Marie Bostwick in her series Cobbled Court Quilts. Katherine Neville - another sequel to The Eight and Fire. Sarah Addison Allen - anything she wants to write! I adore Jasper Fforde and his book Shades of Grey (not the 50 kind). He has said that it's a trilogy but it's been over 2 years and no sign of book 2. Kristin Cashore! I wish I could read all her books again for the first time. I second Bridget's answer of Gillian Flynn! She released that novella, The Grownup, but it was only ok. I'm dying for another novel from her! I need more GRRM too!!!! Dying over here!! I also reeeeeally want another book from Kristin Cashore (Graceling trilogy) and Madeline Miller (The Song of Achilles). They all write so slowly because their words are so gorgeous I guess ;) Also Lindsay Barraclough (Long Lankin and The Mark of Cain)- her books are SO chilling and creepy, I can't wait to see what she'll write next. I didn't finish the 3rd All Souls book but I'm tempted to try it again. I loved the first two a lot! I didn't even realize it was already 5 years since Gone Girl! I don't want more books by authors compared to Gillian Flynn, I want ACTUAL Gillian Flynn!